Bokeh is a large, multi-language project, and relies on varied and extensive tests and testing tools in order to maintain capability and prevent regressions. This chapter describes how to run various tests locally in a development environment, guidelines for writing tests, and information regarding the continuous testing infrastructure. Before attempting to run Bokeh tests, make sure you have successfully run through all of the instructions in the Getting Set Up section of the Developer’s Guide. Additionally, on some platforms you may need to increase the maximum number of open file descriptors as some tests open many files to test the server. py.test -m "unit and not selenium"
To report on a subset of the Bokeh package, pass e.g. -cov=bokeh/models. See the pytest documentation for further information on py.test and its options. The examples tests run a selection of the Bokeh examples and generate images to compare against previous releases. A report is generated that displays the current and previous images, as well as any image difference. The tests do not currently fail if the images are different, the test report must be inspected manually. After the tests have run, you will be able to see the test report at examples.html. Running locally, you can name the test report whatever you want. On TravisCI, the examples report is always examples.html. Where n is the number is the number of cores you want to use. In addition, the examples tests generate a log file, examples.log which you can view at examples.log in the same directory that you the tests were run from. In order to help keep Bokeh maintainable, all Pull Requests that touch code should normally be accompanied by relevant tests. While exceptions may be made for specific circumstances, the default assumption should be that a Pull Request without tests may not be merged. These tests maintain the functionality of the BokehJS portion of the Bokeh project. The BokehJS tests are located in bokehjs/test. They are written using Chai “expect” style. If new test files are added, an appropriate entry in the directory index file should be added. Once a new test is written, a base image for comparison is needed. To create a new base image, add --set-new-base-screenshot to your the standard py.test command to run the test. This will generate an image with the name base__<name_of_your_test>.png in the appropriate directory. Use git to check this image into the repository, and then all future screen shot tests will be compared against this base image. 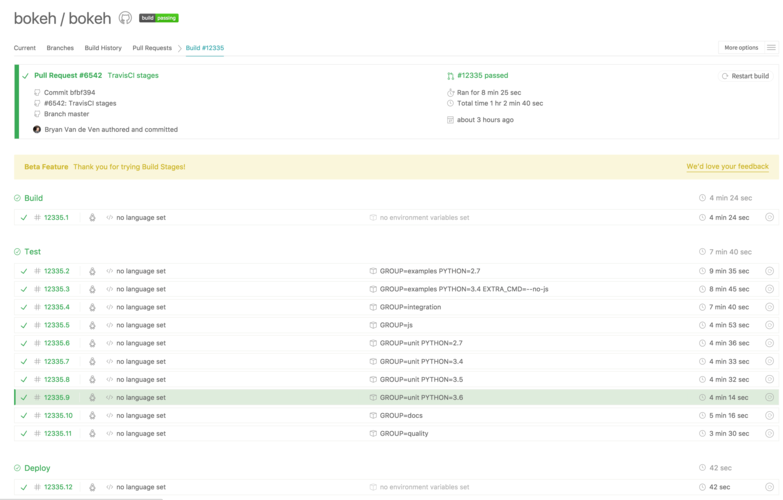 Every push to the master branch or any Pull Request branch on GitHub automatically triggers a full test build on the TravisCI continuous integration service. This is most often useful for running the full Bokeh test suite continuously, but also triggers automated scripts for publishing releases when a tagged branch is pushed. As seen, the status of all build stages and jobs can be quickly inspected. When everything is running smoothly, all jobs will have a green check mark. Instructions for building a conda noarch package for Bokeh. This file is the single source of truth for build and test (but not runtime) dependencies. Used to build sdist packages and “dev” installs. This file is also the single source of truth for runtime dependencies. Contains some global configuration for build and test tools such as versioneer and pytest. The Build stage has a single job that is responsible for creating a noarch conda package for Bokeh. This ensures both that the BokehJS can be built correctly, and that important release packaging machinery is always functional. Additionally artifacts from this build, such as the conda package, and the BokehJS build directory, are saved to be re-used by future jobs, speeding up the entire build. The Test stage is comprised of several jobs that run all the various Bokeh tests. This job executes an integration test, e.g. a Selenium browser test. This job runs all the Python unit tests (i.e. py.test -m unit). The tests are run on different jobs for Python versions 2.7 and 3.5+. This job runs the documentation build. For more information about building or contributing documentation see the Documentation section of the Developer’s guide. This job runs tests that maintain code quality and package integrity. All of these steps are performed for full releases, however some may be omitted for dev builds and release candidates.